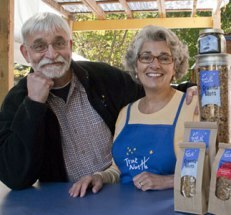 When Ingrid and Franklin Chrisco launched True North Granola in 2006, they were inspired to bring a favorite family recipe to the masses. They also hoped the venture would bring some balance to their lives. At the time, they were both still deeply involved in their careers, Franklin as a teacher and Ingrid as a middle-school principal. They had a vision, but needed help bringing it to fruition. “We’re not naturally entrepreneurs,” Ingrid said. “We know what we know, and we know what we don’t know.” So the couple turned to professional organizations and experts in their field to help them develop and grow their business. The Vermont Small Business Development Center (VtSBDC) was one of the local resources they tapped into. “We can say with certainty that our VtSBDC advisor, Steve, has been the most supportive and knowledge-based advisor we have had,” Ingrid said. From the start, the Chriscos’ goals were clear: They wanted to create healthy granolas that were low in sugar, carbs, and sodium, and included healthy fats. They also wanted their business to give back to the community. “We have made it our mission to support public education with proceeds and products from our business,” Ingrid said. Their VtSBDC advisor, Steve, helped them come up with a plan that would turn their dream into a viable business model. They learned how to increase profitability, add value and growth potential to their business, and think through their goals and priorities. Building a budget was an important piece of this process, Ingrid said. Today True North Granola produces regular granola, as well as gluten-free, vegan, grain-free, and nut-free varieties. They sell their products online and in stores, as well as to a number of wholesale clients.